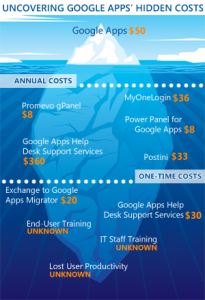 Microsoft’s Tom Rizzo this Wednesday wrote a blog post about the hidden costs of Google Apps. Now, does he do this out of the goodness of his heart? No. Does he do this just for fun since “Google is failing in the enterprise” and Microsoft feels absolutely warm and fuzzy about their place in the enterprise? Of course not. He does this because he has a goal and wants those around him to agree with his goal of moving people back away from Google Apps. Much of his information is incorrect, though to the common reader who has not done the research themselves, seems plausible. Below is my story about how we moved to Google Apps from Microsoft Exchange with much success. We are a 200 person company where about half of our users have email accounts and we’ve actually moved our company over to Google Apps with great success. It took some training since Gmail is obviously different, but it’s been a great experience. The $360 Help Desk Support Services in the graphic is a supplemental service that you don’t have to get. If you buy your Google Apps licenses from a partner like Ltech or CloudSherpas, where the price is still $50/user/year, then you actually get support for free, though only to the account administrators. So the administrators troubleshoot and if it goes above their head, then they come to the partner support. And if you factor in the amount that it costs for support and maintenance of the hardware and software of an Exchange server, which is the primary reason we moved, not for office and such, then you definitely come out ahead. Because the piece they aren’t talking about is that you automatically get offsite storage for all 25GB of your mail, multi-site redundancy, Enterprise messaging and video/voice chat through Google Talk, and you can buy the message security piece, which is the add-on postini piece from the infographic, but you get postini filtering for free. Do you realize how much this would all cost, and how piecemeal it would be if you tried to create a Microsoft Exchange based solution of the same thing. Last year we did the pricing for 100 people and here is what we came out with. Now, for Google Apps, here is our pricing. So, as you can see, Google Apps is still cheaper than both of the other approaches, even without redundancy of the first Exchange scenario. People just haven’t actually done the research on this in order to see the cost savings most of the times, and salesmen like this have a very clear goal and manipulate the numbers to meet that goal. So do your own research if you are actually interested in this and don’t rely on sales techniques. At any rate, Exchange is not as cheap as this article suggests in order to get all of the features of Google Apps. And the vast majority of businesses aren’t even to the size of our corporation, and spending $100 per year on each user for email in a 10 person company makes a lot more sense than setting up all of the infrastructure needs of a fortune 500 company where you need a full time support professional just to troubleshoot all of the server/desktop issues for mail and collaboration alone. Plus you get Google Docs, sites, and lots of other features for free with no maintenance downtime and a 99.9% SLA. Personally, I am going to push this to any organization that I work with or consult with, and our company has been extremely satisfied with all of the features and plan on staying with Apps from here forward. Plus, it definitely helps that I just got my Google Apps Certified Deployment Specialist certification, so I do kind of know what I am talking about. If you’re interested in moving to Google Apps, check out their site, or let me know if you have any questions and I’ll be happy to tell you all about it, or maybe help you make the migration.